Typhoon celebrated his fifth anniversary at Chez Herd last month, so yesterday was time for the annual Little Prince Vet day. Everyone gives me treats here! Some quick background for newer readers (and refresher for the long timers) – Typhoon has had a long history of refusing to eat. All the usual tricks failed. He would reject all kinds of kibbles, canned foods, and raw diets. He refused lots of various human foods including chicken, hamburger, steak, and pork. He was, quite literally, starving to death and refusing to eat to solve it. 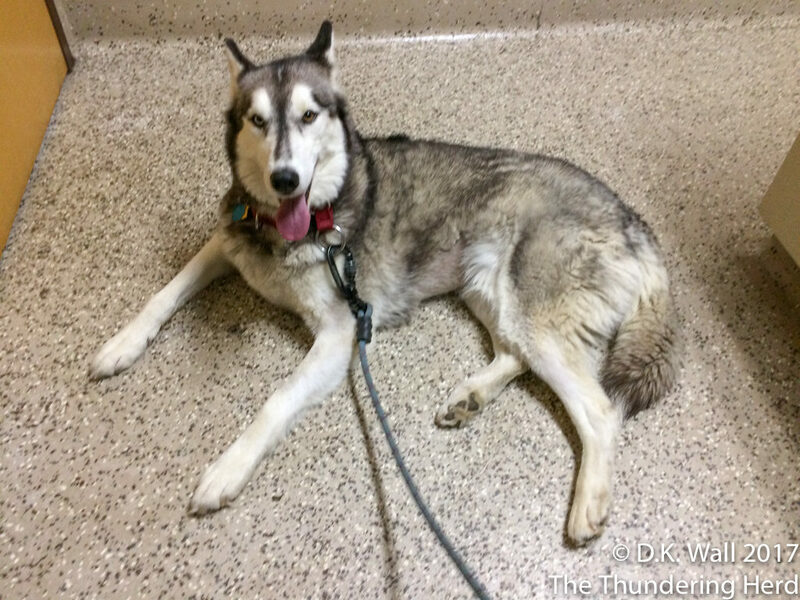 About a year ago, we opted to try a course of steroids to medically induce him to eat. The results on his weight chart speak to the success. Based on his body frame, his healthy weight should be between 50 and 55 pounds. For the first time in his life, he has broken the 50 pound mark. The challenge has been that we have been unable to wean him back off of the steroid. Every time we attempt it, he reverts back to starving which isn’t an option. Best guesses are that he either has a severe case of Irritable Bowel Syndrome (but we don’t have other symptoms) or the adrenal gland is not producing the natural steroids necessary. Getting a definitive diagnosis would require him being off the steroid before tests, which would just put us back in crash mode. Fortunately, a viable treatment for either case includes steroids, so we don’t have to know which it is. So, in summary, the steroids deal with the symptoms and makes him eat, but the bad news is that there are long-term side effects to prolonged steroid use. We have been successful in reducing the amount of steroids and we will continue reducing – slowly – to see if we can find the proper equilibrium point. We mapped out a strategy and goal today (along with an alternate goal in case the first option doesn’t work). Paws crossed we continue to have success but can lower the steroid intake further. By the way, one of the visible side effects of the steroid intake is his bare belly. He was shaved for an ultrasound March 23, 2017, and that is all the hair he has regrown so far. Fortunately, he doesn’t seem to mind rolling in the snow with it, so it is just a looks thing. We celebrate the fact that he is eating regularly, looks forward to his meals, and continues to gain weight. Sometimes, you take what you can get. We have a similar problem with our little guy. He’s a bit smaller thanPrince Phooey, so 40lbs doesn’t seem so severe. He eats, but barely a cup a day. His sister is 80lbs and is hypothyroid. That is a mystery, as we’ve had other breeds that also became hypothyroid. Glad to hear your Prince is eating. Hopefully the steroids can be decreased without him crashing. Eat up Typhoon! You have dogs to chase, and rabbits to annoy! I am so glad he is putting on weight. I know you get lots of suggestions, however I wanted to add one from personal experience. One of my shepherds has autoimmune failure. Besides a myriad of other symptoms, not eating was an issue. She also has to have steroids, however, since I have lupus I am very familiar w the potential damage long term steroids can cause. Once I geot her eating, and as I reduced steroids, I started adding turmeric to her food. It really does not change the taste as much as the color, and while it does not replace the steroids th effect on the autoimmune disease allowed me to lower the level for a much longer time. Now when she flares the steroids do have to increase but.. she has been stable for over a year. I mention this because she has the same hair issue, if she is shaved it will not grow back. Since the turmeric, she has regrown her coat where the fur was lost. Paws crossed for him and hope maybe the suggestion with the Tumeric will help the little Prince! He looks happy and that’s the goal-keeping on the weight and having a happy boy! Mom sez: It is SO aggravating, and such a helpless feeling when you have a dog that won’t eat. 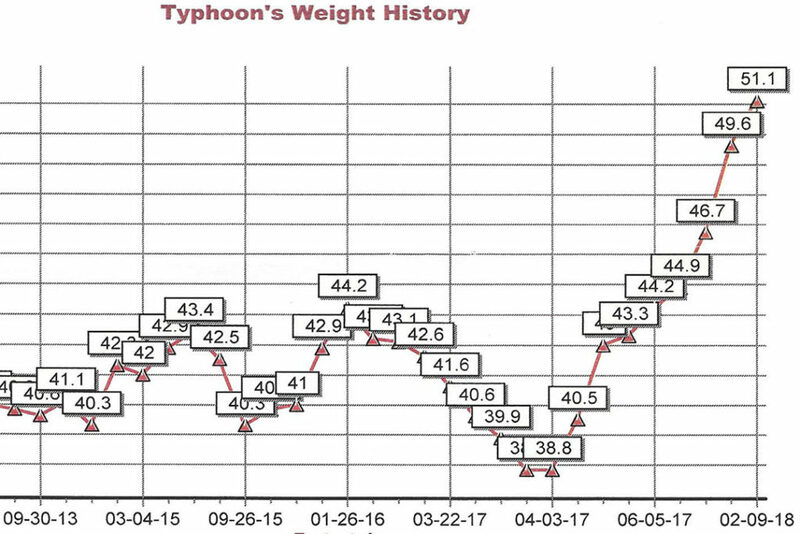 To watch them lose weight like Typhoon does, is frustrating, and heart-breaking. We had that problem with our Ayla, before we finally had to let her cross the Rainbow Bridge, but in her case, she was diabetic, and we finally had to let her cross. Know the feeling well! Have you tried giving him B12 shots? 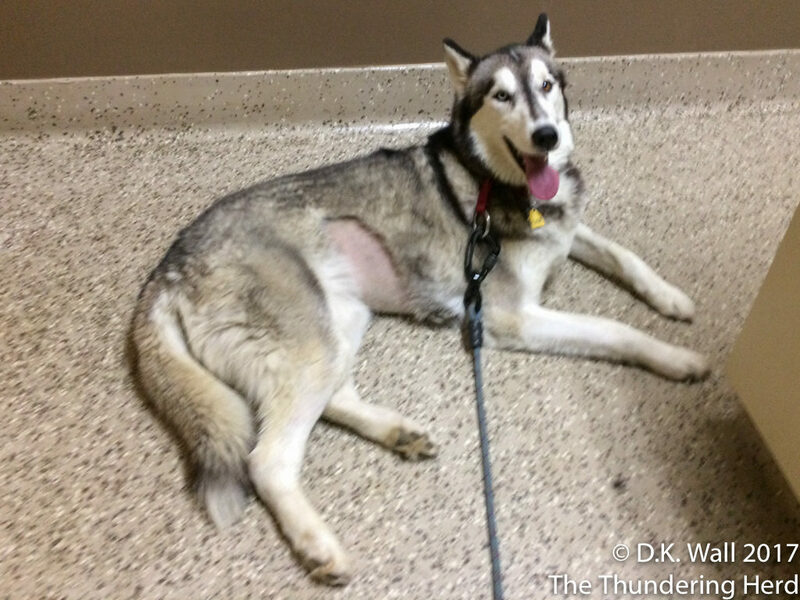 When Bullet had IBD, he refused to eat. Or if he’d eat, he’ll throw it all up. So he was prescribed 0.5ml of budesonide & B12 to help him absorb nurtients. If we miss the B12 we noticed his appetite would go down. Then when we give it, he’ll be back to normal again. Good luck with Typhoon & hope he will do better. My boy, Bear, went through a period of not eating. Believe it or not I called animal communicator (Kathy George) and she talked to him. She said he was just messing with me to see what I would do to get him to eat. She told him to stop doing that to me and he ate immediately. Not saying that is what Typhoon is doing but it might help.